But the government has now backtracked from the policy, after a report in a local newspaper generated criticism. 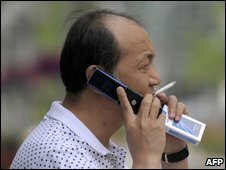 A million people die from smoking-related diseases in China every year, but the local authorities were initially undeterred by the health risks. "The regulation will boost the local economy via the cigarette tax," Chen Nianzu, a member of the cigarette market supervision team in Gong'an county, Hubei province, told the Global Times newspaper. The paper said the measure was probably an attempt to shore up the Hubei brands against tough competition from cigarettes produced in neighbouring Hunan province. On Tuesday, the local government's website published a statement saying "We decided to remove this edict", but declined to elaborate further. Smoking is deep-rooted in Chinese culture - where more than half of all male doctors smoke - and there is still a general lack of awareness about the impact on health. But the authorities have recently started encouraging smokers to kick the habit - even imposing a ban on smoking in public buildings in the capital, Beijing, in the run up to the 2008 Olympic games.